Their reception was held at Arnoldo’s Banquet Center in Riverview Michigan. We actually have done a lot of receptions at this venue. I would say that we do about two dozen wedding receptions there every single year. We work closely with John and Mario the owners of the banquet hall to make sure your reception flows smoothly. For example, they are strict on their load times for the end of the wedding. If you decide to do lighting design at their venue, then we will have to make sure we have everything tore down within one hour to make sure you aren’t charged extra. They have 2 rooms there where you can have your reception (either in the front or back). Regardless, if you plan to have a photo booth at your reception you have a couple choices if you are having your wedding in the larger room. Either you can have the photo booth in the outside foyer or in the banquet room. We recommend that you keep the booth in the same area as the reception to make sure you get your moneys worth on photo booth. I must say I love weddings at this venue. The hall prepares amazing food entrees. Everytime I have had a meal from Arnaldos it has tasted phenomenal. I have been to over 300 halls across the state and this place ranked top 10 by far. I also heard that do a food tasting there every October. It is worth checking out to help with your food selection. Not only that but you can get a good idea of what to expect for your big day. What I really loved about this wedding, was that Jen and Andy picked a lot of good songs. These songs were not your typical Michigan wedd0ing music. Pearl Jam, Eagles, Doors, mostly older chill music. I found out that the couple meet at a Pearl Jam concert in Chicago we played a lot of Pearl Jam. It was nice doing something different for the dinner music. The clients knew exactly what they wanted played throughout the night. We also had a slide show presentation that was done before dinner. Check out their satisfaction survey here and see how much fun they had. 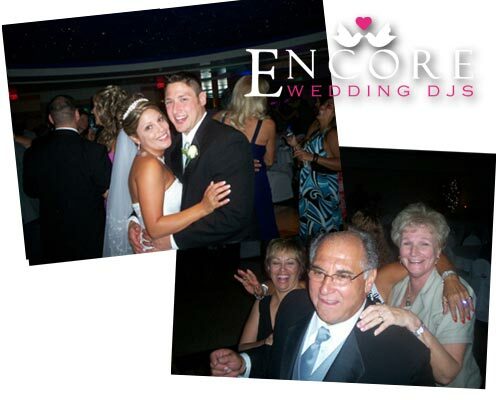 If you are looking for wedding DJs in Riverview Michigan then check our availability to the right! We would love to talk more about how we can give you an Encore Performance.